92% Sauvignon Blanc 8% Semillon Blanc, Hemel en Aarde produceert een van de meest zuivere druiven van Zuid Afrika, mooie mineralen en dan wat geeikte Semillon erbij voor balans! Nieuw Zeeland geschoolde wijnmaker!! 100% Riesling - BONE DRY!! This limited offering is our Riesling from shy-bearing vineyards that are situated in Hemel en Aarde Ridge. 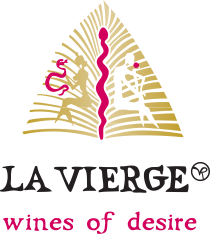 The wine is a true reflection of the potential of the unique terroir of our La Vierge Farm. Enjoy this crisp Alsace style wine with spicy and perfumed stir fry’s and eastern salads. The profile of this wine is based on the vines planted on a variation of Shale and Clay based soils. The wine therefore expresses the zip and texture of the clay on the palate and aromatic lime, white floral and stone fruit, mineral character on the nose. Enjoy now or allow to age for maximum result and enjoyment. Enjoy now or allow to age for maximum result and enjoyment. This wine combines well with seafood and white meat dishes. This, our wine of Seduction, a Pinot Noir from our younger vines situated in the ward of Hemel en Aarde Ridge. This wine shows cool climate attraction and elegance with a shining, bright fruit character. On the eye she has a clear, bright red hue with a purple tint. On the nose she delivers ripe succulent raspberries and cherries with a hint of warm spiciness. And on the palate she offers a seduction folded in waves of red fruit and savoury enticement. Name: As Eve offered Adam the forbidden fruit, she became the first seductress and he the first to experience seduction. This wine was specially crafted to seduce the inquisitive minded wine-lover into the world's most elegant, feminine, and sometimes elusive cultivar, Pinot Noir. Enjoy this wine with tapas snacks, cheese and light meals with friends and good times. To show her true delicate nature, served slightly chilled. Whether a mystical pagan goddess of feminine power such as Isis, or the popular Catholic of the Virgin Mary with a darker complexion as reflected in artwork around the world, the Black Madonna or Black Virgin is an apt name for our Pinot Noir. This wine shows cool climate poise and elegance with an earthy and bright fruit character.This vintage expresses the typical earthy and savoury aroma of this fine Burgundy variety and is backed by a red fruit character. A greater selection clones and blocks during picking and older elements in the blend shows a darker and more textured style in bottle from previous vintages. Delicate tannins and an elegant mineral core will see this wine drinking well on release and developing for at least 5 years. Enjoy this wine with mushroom risotto, roast game, cream-based pasta and hard cheese platters. The Affair Pinot Noir is a refined style of Pinot Noir showcasing the love affair between the soft, feminine side of Pinot, being the floral notes, hints of spice and silkiness; and the masculine linear strength of the tannins, hints of oak and brooding dark forest floor aromas. The palate is both silky and textured, displaying a lovely roundness as well as soft, integrated tannins and length. Enjoy this wine with tapas snacks, cheese and light meals with friends and good times. To show her true delicate nature, served slightly chilled. Volle rode droge wijn met veel cassis, heidegeuren, kruiden en aardse tonen. Goed in de zuren en mooi gebalanceerd, een lange afdronk. De wijn is gemaakt van 70% Cabernet Sauvignon en 30% Malbec. De overheersing van de Cabernet wordt gebroken door de karaktervolle Malbec. Eikenhouten vaten die in de Bordeaux gebruikt worden zijn hier ook toegepast. 15 maanden rijping geeft een mooie houtintegratie. This elegant expression of cool climate Syrah exhibits soft plum, dark cherry and complex spicy notes of pepper, cinnamon, cloves and crushed coriander. The palate is full and lush, broad on entry and rich in dark fruits. Enjoy now or for the next 5 years. This wine shows the gamy tea leaf character of Sangiovese, the red fruit and spice of the Nebbiolo and the bright cherry fruit character of the Barbera. Chunky tannin and a bright acidity will see this wine drinking well on release and developing for at least 5 - 7 years. Enjoy this wine with creamy pastas, mushroom risotto's and cheese platters.